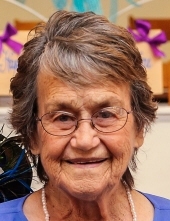 Mrs. Katherine Hawk Craven, 88, passed away Thursday, March 28, 2019, at Hospice LaGrange. Born October 15, 1930 in Heard County, Mrs. Craven was the daughter of the late G.C. and Mamie Purgason Hawk. She was a lifelong resident of the Hogansville and Corinth area, and loved fishing and tending to her flowers. Mrs. Craven was a lifelong devoted member of Hogansville Church of God. Survivors include her daughters and sons in-law, Linda Sue and Gene Groce of Rural Hall, NC, Rita and Eddie McMichael of Grantville, and Sherrie and Randy Mobley of Hogansville; son and daughter in-law, Anthony and Denise Craven of Hogansville; seven grandchildren; eight great-grandchildren; and her special friends at Twin Fountains Nursing Home, Nancy Jones and Jearline Caldwell. In addition to her parents, Mrs. Craven was preceded in by her husband, Willard Alton Craven. Funeral services will be 1:00 p.m., Saturday, March 30, at the Hogansville Church of God. The Reverend Randall Hodge will officiate and interment will be in the Corinth Cemetery. The family will receive friends at the church from 12 until 1 Saturday afternoon and will be at the home of her daughter and son in-law, Randy and Sherrie Mobley. To send flowers or a remembrance gift to the family of Katherine H. Craven, please visit our Tribute Store. "Email Address" would like to share the life celebration of Katherine H. Craven. Click on the "link" to go to share a favorite memory or leave a condolence message for the family.